Defense Secretary Gates has been designated to keep the federal government functioning in the event of a catastrophic event that disrupts the transfer of power on Inauguration Day. WASHINGTON (CNN) – Defense Secretary Roberts Gates will be playing a critical but low profile during Tuesday’s inauguration. Gates has been named to act as the “designated successor” during inaugural events, according to a statement from White House Press Secretary Dana Perino Monday. 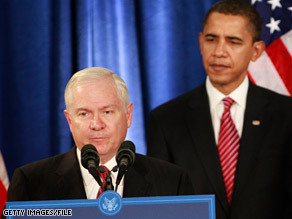 In the role, Gates will be responsible for keeping the federal government running in the event of any kind of catastrophic event that disrupts the transfer of power between President Bush and President-elect Barack Obama, who agreed with Bush’s selection of Gates for the special task. Gates will spend the inauguration at a military installation outside Washington, according to a senior Pentagon official. There are a number of places set up around the country for remote command of the military and the rest of the federal government in the event of a catastrophe. In the absence of any unforeseen event, Gates will be undesignated after Obama’s swearing in. A Pentagon official knowledgeable about the designation of Gates would not say whether the Defense Secretary has already left the Washington area. Gates is the only cabinet-level official who will serve in both administrations. –CNN's Ed Henry, Suzanne Malveaux, and Barbara Starr contributed to this report.